Qingdao Ecopure Filter Co., Ltd. FL-RF46-3 - Filterlogic fl-rf46 replacement refrigerator water filter where healthy water begins compatible models lg lt1000p, lfxs26566s, adq74793502, lmxc23796m, lfxc24796s, lmxs30796d, lfcs28768s, lsxc22396d, lsfxc2496d, lmxs30796s, lfxc22596s, lfxs26566m, 9980; lfcc22426s, lfxs27466, lfxc22526s, lmxs28626, lmxs28636s, lfxs28968s, lfxs28566m, lfxc24796d, lt-1000pc, lmxc23796s, lfxs28596m, lfxs30796s, lfxs26973s, lfxs26596s, lsxs26336s, lfxs28596d, lfxs28968d, lfxs28596s, lfxs30796d, lfxs28968, lmxs28626s, mdj64844601; kenmore 46-9980, lfxs26596m, lfxs28566s, lt1000pcs, lsfxc2496s, lfxs26973d, lmxc23796d, lmxs28636, lfxs28566, lfxs28566d, lt1000pc, adq74793501, LSXS26396S, LSXC22396S, LMXS28626D, LFXS27466S 100% Satisfaction Guarantee FilterLogic offers unconditional 30-day money back guarantee.
. This filter is not the original product. Replacement for lg lt1000p, aqua blue ab-9834, icepure rwf4700a-s, mist cwmf002, 9980; belvita bl003-s, lt-1000pc, oh oh-1000p, adq74793502, mdj64844601; kenmore 46-9980, glacier fresh gf-1000p, aqua crest aqf-lt1000p, adq74793501, colpure clt-2, tier1 rwf1053, pureza pf15, GOLDEN ICEPURE RWF4700A, LT1000PCS, pureplus pp-lt1000p, zwfl7-rf300, Waterspecialist WS646A, lt1000pc, maxblue mb-lt1000p, waterdrop wd-lt1000p, FilterLogic FL-RF46. 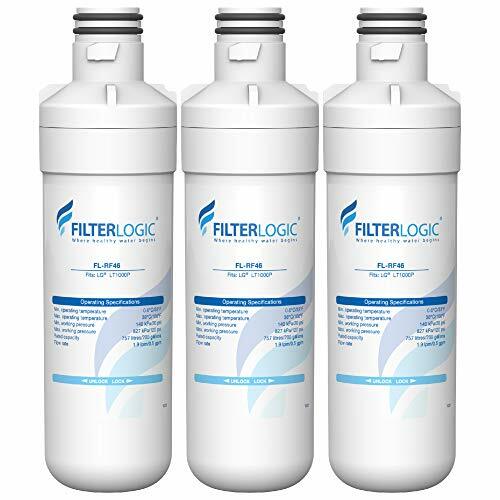 FilterLogic MDJ64844601 Refrigerator Water Filter, Replacement for LG LT1000P, LT1000PC, LT-1000PC, LT1000PCS, ADQ74793501, ADQ74793502, Kenmore 46-9980, 9980 Pack of 3 - Please note this is a compatible spare part and the manufacturers' names and part numbers have been used for reference purposes only. Our professional customer service team will take care of your problem in a timely manner. Provides 6 months or 200 gallons of refreshing water for the average household. 100% satisfaction guarantee with the top-quality product, prompt service and timely delivery.
. ADQ73214404 - The lt120f utilizes your refrigerators forced air circulation to neutralize the air inside your refrigerator. Compatible with lfx31925st, lfx31935st, lfx31945st, lfx33975st, lfx29927sb, lfx29927st, lfx31925sw, lfx29927sw, lfx28968st, lfx31995st, lfx329345st, lfx31925sb, lmx31985st, lfx25991st, lfx29945st, lmx30995st, LSC22991ST. Part number: adQ73214404. Let the lt120f replacement air filter go to work for you, order today! Helps keep tastes and odors separated. The 3-pack lg lt120f fresh replacement refrigerator air filter goes to work immediately keeping your food's tastes and smells separated, helping make your investments last longer! Each filter lasts for up to six months, depending on operating conditions. LG LT120F Replacement Refrigerator Air Filter, Pack of 3 - . Filter sold without box packaging. Clearwater Filters CWFF343 - Filter sold without box packaging. High quality, adq73214403, adq73214404, affordable activated carbon air filter replacement for lG LT120F ADQ73214402, ADQ73334008 and Kenmore 46-9918. Reduces odors! 15 times more effective than baking soda. Long lasting replace every six months. Compatible with lfx31925st, lfx31935st, lfx31995st, lfx28968st, lfx29927sb, lmx31985st, lfx29927sw, lfx29927st, lfx31925sb, lfx31925sw, lfx329345st, lfx25991st, lfx31945st, lfx29945st, lfx33975st, lmx30995st, LSC22991ST. Part number: adQ73214404. Fresh by clearwater premium activated carbon air filter compatible with the following part numbers: lg part numbers: lg lt120f, lfx31925st, 46-9918, lfx31925sw, 46-9918, lfx31925sb, 72353, lfx25991st, 7206x, adq73214402, 469918, adq73214403, lfx31925st, lfx33975st, lfx29927sb, 7218x, lfx29945st, 72193, 469918, lfx329345st, adq73334008, lt120f kenmore models: 7204x, lfx31995st lmx31985st, adq73214404fits the following refrigerators: lg models: lfx25991ST, LFX29927ST, ADQ73214404, 7209x, LFX31935ST, 7205x, LSC22991ST, LMX30995ST, LFX29927SW, 9918 Kenmore part numbers: 9918, LFX31945ST, 7237x Helps keep tastes and odors separated. Fresh LG LT120F Kenmore 469918 Replacement Refrigerator Air Filter, 3 Pack - Fresh filter line by ClearWater the higher standard in affordable refrigerator filtering. Guaranteed satisfaction or 100% money back. YUNDA - A index to measure the product's absorption ability to the harmful substances in the air. Effectively reduce odor af004 air filter ensures the highest Standard Of Contaminant Reduction, Especially The Odors In Your Refrigerator, That's Why Our Filters Add Freshness To Your Refrigerator. 100% guaranteewe are sure you'll enjoy the benefits of our product. Helps keep tastes and odors separated. Filter sold without box packaging. Fresh filter line by ClearWater the higher standard in affordable refrigerator filtering. Guaranteed satisfaction or 100% money back. For detailed setup guideline, please refer to the installation instruction in the box. C-activated Carbon Sponge: high dirty holding ability. ICEPURE LT120F Refrigerator Air Filter Replacement for LG LT120F, Kenmore Elite 469918, ADQ73214402, ADQ73214404,3PACK - Efficient and durablesome filter used a pleated activated carbon paper. We tested the total bar of the original filter is below 33-35%;icepure AF001 Air Filter : the BAR of A layer is 25-28%; the BAR of B layer is 44%. Af004 air filter compatible withlg lt120f, 469918, adq73214403, adq73214404, adq73214402, and 9918importantplease be aware that this is a compatible spare part, Kenmore Elite 46-9918, ADQ73334008, The Manufacturer's Names, Part Numbers Have Been Used For Compatibility Information ONLY. Easy installation and Operation No tools required. Over 30% higher effects than the other filter. Bar=benzene Adsorption Rate. K&J - Economical - We manufacture filters only. Filter sold without box packaging. We offer 90-day money back guarantee and a friendly customer service. Please note that this is a compatible spare part, The Manufacturer's Names, Part Numbers Have Been Used For Compatibility Information ONLY. Compatible modelcompatible with lg lt120f, adq73214404, 469918, adq73334008, kenmore elite 46-9918, adq73214403, adq73214402, and 9918. Highest quality filtration - the triple-layer filtration and unique pressed-carbon final stage filter filters the finest air particulate, including food and chemical odors. 3-pack of lg lt120f air filterslook no further than k&j charcoal Filters for the perfect OEM replacement filter for your refrigerator! Our filters are higher quality for a fraction of the price of Brand name filters. Fits LT120F and ADQ73214404 Refrigerator Air Filters - Fresh Air Filter 3-Pack - K&J 3-Pack LG LT120F Compatible Air Filters - Over 30% higher effects than the other filter. Bar=benzene Adsorption Rate. So the total baR is over 50% at least. High quality, adq73214403, adq73214404, affordable activated carbon air filter replacement for lG LT120F ADQ73214402, ADQ73334008 and Kenmore 46-9918. Reduces odors! 15 times more effective than baking soda. Long lasting replace every six months. This results in the cleanest-smelling, sterile refrigerator air space. Extracts air-borne contaminants - K&J's activated charcoal layer ensures the highest standard of contaminant retention and is 20 times more effective than baking soda. NINGBO PUREZA TECHNOLOGY,LLC Refrigerator Air Filter - Designed to fit: kenmore, lg, and other refrigerator models that require the LT120F Air Filter. Quick & easy installation: replace every 6 months to keep odors from your refrigerator, fish, garlic, stale milk, like onions, and over-ripe fruits and vegetables. Lt120f, 469918, 46-9918, adq73214403, adq73214402, adq73334008, adq73214404, and 9918. Contains 3 air filters which help keep your fridge fresh and odor free. High quality, adq73214403, adq73214404, affordable activated carbon air filter replacement for lG LT120F ADQ73214402, ADQ73334008 and Kenmore 46-9918. Reduces odors! 15 times more effective than baking soda. Long lasting replace every six months. BELVITA Refrigerator Air Filter Replacement Compatible with LG LT120F ADQ73214404 ADQ73214402 469918 9918 46-9918-3 Pack - So the total baR is over 50% at least. This results in the cleanest-smelling, sterile refrigerator air space. Extracts air-borne contaminants - K&J's activated charcoal layer ensures the highest standard of contaminant retention and is 20 times more effective than baking soda. Maintains true food flavor - filtering the natural scents and aromas which fill the air in your fridge prevents cross-contamination of flavors, especially from meats to vegetables. Filter sold without box packaging. Over 30% higher effects than the other filter. Bar=benzene Adsorption Rate. Commercial Water Distributing LT120F - Fresh filter line by ClearWater the higher standard in affordable refrigerator filtering. Guaranteed satisfaction or 100% money back. This results in the cleanest-smelling, sterile refrigerator air space. Extracts air-borne contaminants - K&J's activated charcoal layer ensures the highest standard of contaminant retention and is 20 times more effective than baking soda. Maintains true food flavor - filtering the natural scents and aromas which fill the air in your fridge prevents cross-contamination of flavors, especially from meats to vegetables. Help keep your food tasting fresh by periodically changing your refrigerator's air filter. Over 30% higher effects than the other filter. Bar=benzene Adsorption Rate. High quality, adq73214403, adq73214404, affordable activated carbon air filter replacement for lG LT120F ADQ73214402, ADQ73334008 and Kenmore 46-9918. Reduces odors! 15 times more effective than baking soda. Long lasting replace every six months. High-efficiency filtrationfilter in three layers，a-non-woven cloth:remove big impurities. LG LT120F-2PK Fresh Air Filter 2 Pack - B-activated carbon Fiber:good absorption ability to odor, smoke, etc. A index to measure the product's absorption ability to the harmful substances in the air. Effectively reduce odor af004 air filter ensures the highest Standard Of Contaminant Reduction, Especially The Odors In Your Refrigerator, That's Why Our Filters Add Freshness To Your Refrigerator. Exact Replacement 3P-LT120F - Replace every 6 month. We offer 90-day money back guarantee and a friendly customer service. Please note that this is a compatible spare part, The Manufacturer's Names, Part Numbers Have Been Used For Compatibility Information ONLY. Compatible modelcompatible with lg lt120f, adq73334008, 469918, adq73214404, adq73214403, adq73214402, kenmore elite 46-9918, and 9918. Highest quality filtration - the triple-layer filtration and unique pressed-carbon final stage filter filters the finest air particulate, including food and chemical odors. Designed to fit: kenmore, lg, and other refrigerator models that require the LT120F Air Filter. Quick & easy installation: replace every 6 months to keep odors from your refrigerator, like onions, garlic, stale milk, fish, and over-ripe fruits and vegetables. 3 Pack Replacement, Refrigerator Air filter to LG LT120F, ADQ73214404, Kenmore 469918 - Lt120f, adq73214402, adq73214403, adq73214404, 46-9918, 469918, adq73334008, and 9918. Contains 3 air filters which help keep your fridge fresh and odor free. Part number Adq73214404. Replaces lg lt120f, lg adq73214404, kenmore 469918. This results in the cleanest-smelling, sterile refrigerator air space. Extracts air-borne contaminants - K&J's activated charcoal layer ensures the highest standard of contaminant retention and is 20 times more effective than baking soda. Maintains true food flavor - filtering the natural scents and aromas which fill the air in your fridge prevents cross-contamination of flavors, especially from meats to vegetables. - Part number Adq73214404. If so, you should replace a powerful pureza adq73214404 lg filter to ensure that adq73214404 filter to filter toxic substances, malodors, and all foods are fresh and delicious, fresh air filter the daily diet of you and your family is improved. Greatly reduce the bad smell! We offer 90-day money back guarantee and a friendly customer service. Please note that this is a compatible spare part, The Manufacturer's Names, Part Numbers Have Been Used For Compatibility Information ONLY. Compatible modelcompatible with lg lt120f, kenmore elite 46-9918, adq73214402, adq73214403, adq73214404, adq73334008, 469918, and 9918. Highest quality filtration - the triple-layer filtration and unique pressed-carbon final stage filter filters the finest air particulate, including food and chemical odors. Replacement for LG LT120F, Kenmore 469918 Air Filter Compatible with ADQ73214402, ADQ73214403, ADQ73214404, 46-9918, 9918 Refrigerator Air Filter by Pureza, Pack of 3 - Lifetime pureza lg refrigerator air filter replacement is usually changed every six months, depending on operating conditions. Pureza finishing each pureza lt120f filter is individually sealed to maintain high quality and 100% customer satisfaction. Adq73214404 lg has three packs of fresh air filter, lfx29927sw, each individually sealed to ensure to filter and purify the quality of the air filter!!! pureza adq73214404 refrigerator air filter due to the carbon-activated material, lmx31985st, lfx31925sw, lfx31925sb, this air filtration system absorbs odors several times more than baking soda!!! compatible lg and other filter models/part numbers: ●lg lt120f ●lg adq73214404 ●adq73214404 air filter ●adq73334008 ●adq73214402, lfxs30726s ●ap5629741 ●ps3654115 ●2308805 compatible with kenmore elite air filter model/part number: ●kenmore elite air filter 9918 ●adq73214404 kenmore ●adq73214404 kenmore refrigerator air filter ●Kenmore adq73214404 ●kenmore air filter 46-9918 Compatible with the following LG models: ●LFX31925ST, LFX29927ST, LFX25991ST ●LFX31945ST, ADQ73214403, LFX28968ST, LFX29927SB, LMX30995ST, LFX29945ST ●LFX31935ST, ADQ73214406 ●LFXC24726S, LFX33975ST, LFX329345ST, LFX31995ST ●LSC22991ST Pair with LG Water Filters for: ●LT700P ●LT800P ●LT1000P Please check if your refrigerator model matches the refrigerator model above. High quality, adq73214404, affordable activated carbon air filter replacement for lG LT120F ADQ73214402, adq73214403, ADQ73334008 and Kenmore 46-9918. Reduces odors! 15 times more effective than baking soda. Exact Replacement 6P-LT120F - High-efficiency filtrationfilter in three layers，a-non-woven cloth:remove big impurities. B-activated carbon Fiber:good absorption ability to odor, smoke, etc. Designed to fit: kenmore, lg, and other refrigerator models that require the LT120F Air Filter. Quick & easy installation: replace every 6 months to keep odors from your refrigerator, fish, garlic, stale milk, like onions, and over-ripe fruits and vegetables. Lt120f, 469918, adq73214403, adq73214402, adq73214404, adq73334008, 46-9918, and 9918. Contains 3 air filters which help keep your fridge fresh and odor free. We offer 90-day money back guarantee and a friendly customer service. Please note that this is a compatible spare part, The Manufacturer's Names, Part Numbers Have Been Used For Compatibility Information ONLY. 6 Pack Replacement, Refrigerator Air Filter to LG LT120F, ADQ73214404, Kenmore 469918 - Compatible modelcompatible with lg lt120f, 469918, kenmore elite 46-9918, adq73214403, adq73214404, adq73214402, adq73334008, and 9918. Highest quality filtration - the triple-layer filtration and unique pressed-carbon final stage filter filters the finest air particulate, including food and chemical odors. Reduces odors in your fridge. It fit lg and kenmore Refrigerator certain models Helps keep tastes and odors separated. Compatible models pureza lg lt120f air filter for lg lt120f, adq73334008, adq73214403, 46-9918, 9918, adq73214404 lg refrigerator air filter, lg air filter lfxs28968s, kenmore 469918, ADQ73214402, lg lmxs30776d air filter, ADQ73214404, 9918 kenmore air filter and kenmore elite air filter . Unique technology pureza lg air filter lt120f has three layers of filtration and unique pressed carbon, this air filtration system absorbs many times more odor than baking soda! Refresh - Please contact us if you have any questions about whether this model is compatible with your filter! Customer satisfaction is our top priority, and we want to be sure you are receiving the correct filter. C-activated Carbon Sponge: high dirty holding ability. Efficient and durablesome filter used a pleated activated carbon paper. We tested the total bar of the original filter is below 33-35%;icepure AF001 Air Filter : the BAR of A layer is 25-28%; the BAR of B layer is 44%. Buy with confidence from refresh and refresh your water today! this refresh filter is compatible with lg part numbers: lg lt120f, adq73214404, lfx31925sb, 7205x, lmx30995st, lfx31925st, 469918, 7218x, 72193, lfx31935st, 469918, 46-9918, lfx31925sw, lfx329345st, adq73214402, lfx29927st, lsc22991st, lfx25991st, lfx33975st, lfx31925st, lfx31995st lmx31985st, 46-9918, lfx31945st, 72353, adq73214403, 7209x, lfx29927sb, lt120f this refresh filter is also compatible with kenmore part numbers: 9918, ADQ73334008, ADQ73214404 This Refresh Filter is compatible with these Kenmore Refrigerators: 7204x, 9918 This Refresh Filter is also compatible with LG Refrigerators: LFX25991ST, LFX29927SW, 7206x, LFX29945ST, 7237x Helps keep tastes and odors separated. Refresh Replacement for Kenmore 46-9918, 9918, 469918, ADQ73214402, ADQ73214404 and LG LT120F Refrigerator Air Filter 3-Pack - Compatible with lfx31925st, lfx31925sb, lfx329345st, lfx31995st, lfx29927st, lmx30995st, lmx31985st, lfx33975st, lfx31945st, lfx28968st, lfx31925sw, lfx29945st, lfx31935st, lfx29927sb, lfx25991st, lfx29927sw, LSC22991ST. Part number: adQ73214404. Change your air filter approximately every six months and/or when your change filter light comes on your led control panel. Filter sold without box packaging. Purifying your fridge's air leads to keeping the true flavor of your food intact. 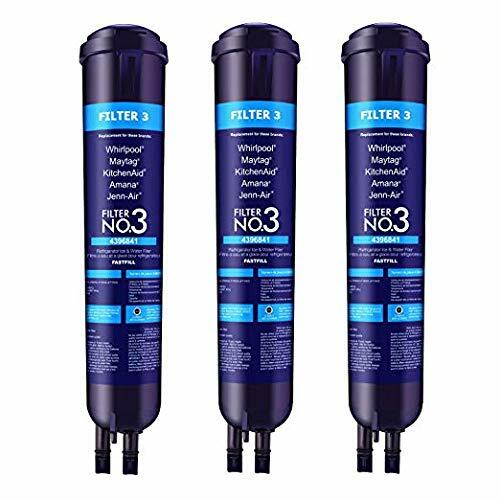 Water Filter 3 Replacement Compatible for Filter 3 9083 9020 9030 WF2 4396841 4396710 EDR3RXD1 Pack of 3 - Designed to replace sears kenmore 4609020000 46-9020 46-9030 4609030000 469020 469030 9020 9030 9020P 9030P 9020B 9030B. Designed to replace pur - 2260515 95357630 2260538 2305222 2305267 2313412 p1kb2 p1rfkb1 p1rfkb2 p1rfwg2 p1wb2l p1wg2 p1wg2l p2rfwg2 p2wg2l pb-ss ps986832 p1kb1 p1rfwb2 p1wb2 p1wg2 pBSS PS971185 Filters. Flush 4 to 5 gallons of water through cartridge before using. Our refrigerator water filters provide a great tasting, healthy, and more cost-efficient alternative replacement for your refrigerator drinking water and ice. Compatible brands: kenmore, p2rfwg2, ps971185, p1wb2l, p2wg2l, 9020, 9030, maytag, p1rfwb2, 469020, kitchenaid, water filter 3, 9083, p2rfwg2, jenn-air, Amana Refrigerator Filters Compatible Models: 469083, 469030, Filter 3 Replacing your refrigerator water filter is important when considering the maximum efficiency of your refrigerator. Sub-Zero - Meets or exceeds nsf/ANSI Standards 42 and 53. Factory certified oem authentic and Genuine part from Sub-Zero in Madison, Wisconsin. 4204490 replacement water filter Fits Built-In, PRO48, and Integrated Refrigerators. Made in the U. S. A. Ensures your sub-zero serves the highest quality water and ice for up to twelve months.
. Only use genuine Sub-Zero water filters in your Sub-Zero Refrigerator. Authentic sub-Zero Factory Certified Water Filter. Genuine oem part from the sub-zero factory in Madison, WI. This sub zero water filter replacement part will ensure that your whole family is drinking safe drinking water. This 4204490 replacement subzero water Filter can be used in Built-In Refrigerators, Integrated Refrigeration, and PRO refrigeration. 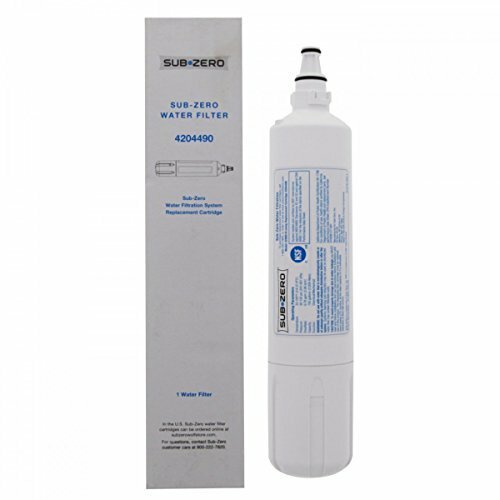 Sub-Zero 4204490 Refrigerator Water Filter Replacement Cartridge - To ensure clean crisp water, make sure to replace your Subzero Water Filter 4204490 every six months. Subzero 7007067 - This is perfectly normal. Please wipe clean before installing. When you shake the air filter, the charcoal will bump up against the lamp and something it will sound like the unit is broken. My product was delivered with a thin coating of dust on it, is this a used product The Sub-Zero Air filter contains Activated Charcoal, which is used in conjunction with several parts within the filter to remove harmful bacteria in your refrigerator. The unit is usually not broken. Authentic Sub-Zero Factory Part. 2. Air purification lamp contains Mercury Authentic sub-zero Factory Certified Microbiological Purification System. Bullets change to: authentic sub-zero factory certified microbiological Purification System Compatible with All Sub-Zero Models That Use Air Purification Part Number 7007067 Transfer and settlement of charcoal is normal during shipment. Sub-Zero 7007067 Refrigerator Air Purification Cartridge - The part will arrive in the factory packaging, with the manufacturers instructions. Please wipe the unit with a paper towel before installing. Compatible models the built-in bi series and integrated IC, ID-30RP, IT, and ID-36RP Series are the only models with air purification systems. Once you install the new air filter inside the Refrigerator and reset the Pure Air button, if the unit is damaged, your Sub-Zero will promptly alert you. This is normal, and is not the result of a broken unit. They are genuine Sub-Zero parts. Subzero - Your refrigerator will alert you when it is time to replace the cartridge. Authentic sub-zero Factory Certified Microbiological Purification System. Part number 7007067. Part number 7007067. Properly maintaining the air purification system in your Sub-Zero refrigerator ensures that it will scrub the air of mold, viruses and bacteria - contaminants too small for conventional filters - and lessen the ethylene gas that hastens food spoilage. Freshness That Lasts. Part number 7007067 Pack of 2. Air purification Lamp Contains Mercury. Air purification Lamp Contains Mercury. Compatible with all Sub-Zero Models That Use Air Purification. Freshness That Lasts. Compatible with all Sub-Zero Models That Use Air Purification. Authentic Sub-Zero Factory Part. Authentic sub-zero Factory Certified Microbiological Purification System. Commercial Water Distributing 7012333 - For that, you should purchase item number 4204490 Please note: this filter is for use in the Sub-Zero line of Icemakers only and will not fit your Sub-Zero Full-Size Refrigerator. Compatible with all Sub-Zero Models That Use Air Purification. Compatible with all Sub-Zero Models That Use Air Purification. Freshness That Lasts. Genuine OEM Product. Authentic sub-zero Factory Certified Microbiological Purification System. Air purification Lamp Contains Mercury. Provides up to six full months of performance, based on water quality and usage. Life expectancy of the water filter is 6 months during normal usage. Freshness That Lasts. Authentic sub-zero Factory Certified Microbiological Purification System. Sub-Zero 7012333 UC-15 Ice Maker Water Filter - Part number 7007067 Pack of 2. Authentic sub-zero factory Certified Water Filter 7012333. Air purification Lamp Contains Mercury. For use with the following models: UC-15 and UC-15IO. Inhibits scale formation and filter sediment, and removes chlorine odor and taste, so your ice is always clean and refreshing. Subzero - For use with the following models: UC-15 and UC-15IO. Authentic sub-zero factory Certified Water Filter 7012333. Reduces sediment and chlorine taste, while inhibiting the growth of scale. Sub-zero factory Certified OEM Purification System. Freshness That Lasts. Part number 7007067. Compatible with all Sub-Zero Models That Use Air Purification. Freshness That Lasts. Air purification Lamp Contains Mercury. Part number 7007067 Pack of 2. Authentic sub-zero Factory Certified Microbiological Purification System. Genuine OEM Product. Model # 7007067. Air purification Lamp Contains Mercury. Provides up to six full months of performance, based on water quality and usage. Sub-Zero 7007067 Refrigerator Air Purification Cartridge by Subzero - Authentic sub-zero Factory Certified Microbiological Purification System. Compatible with all Sub-Zero Models Which Use Air Purification. Compatible with all Sub-Zero Models That Use Air Purification. Subzero - Air purification Lamp Contains Mercury. Air purification Lamp Contains Mercury. They are genuine Sub-Zero parts. All of the sub-zero Air filters are supplied by the Sub-Zero factory. The part will arrive in the factory packaging, with the manufacturers instructions. Authentic Sub-Zero Factory Part. Compatible with all Sub-Zero Models Which Use Air Purification. Please wipe the unit with a paper towel before installing. Authentic sub-zero Factory Certified Microbiological Purification System. Freshness That Lasts. Air purification Lamp Contains Mercury. Integrated drawer models ID-30R and ID-36R do not have air purification systems. Compatible with all Sub-Zero Models That Use Air Purification. Sub-Zero 7007067 Refrigerator Air Purification Cartridge Pack of 2 - 2. Compatible with all Sub-Zero Models That Use Air Purification. Once you install the new air filter inside the Refrigerator and reset the Pure Air button, if the unit is damaged, your Sub-Zero will promptly alert you. Reduces sediment and chlorine taste, while inhibiting the growth of scale. Freshness That Lasts. Sub-Zero - Freshness That Lasts. Sub-zero factory Certified OEM Purification System. Part number 7007067 Pack of 2. Compatible with all Sub-Zero Models Which Use Air Purification. Air purification Lamp Contains Mercury. Air purification Lamp Contains Mercury. Freshness That Lasts. Authentic sub-zero factory Certified Water Filter 7012333. Model # 7007067. Authentic sub-zero Factory Certified Microbiological Purification System. Compatible with all Sub-Zero Models That Use Air Purification. Reduces sediment and chlorine taste, while inhibiting the growth of scale. Part number 7007067 Pack of 2. Part number 7007067. Authentic sub-zero Factory Certified Microbiological Purification System. 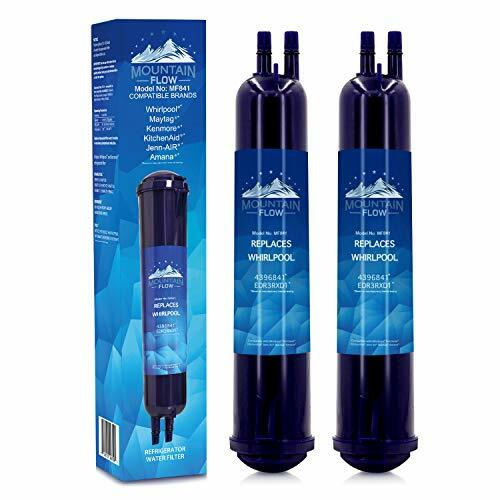 Sub-Zero Refrigerator Replacement Water and Air Filter Combo Pack 4204490 7007067 - Compatible with all Sub-Zero Models That Use Air Purification. Freshness That Lasts. Ensures your sub-zero serves the highest quality water and ice for up to six months. Authentic sub-zero Factory Certified Microbiological Purification System. Factory OEM parts. Durgol 0297 - Regular use ensures proper functioning of the appliance; optimal quality of steamed foods. Environmentally safe; 100% recyclable PET bottles. Genuine OEM Product. Highly effective, fast safe and easy to use. Durgol swiss steamer decalcifies high-quality household steamer ovens of all brands. Part number 7007067 Pack of 2. Meets or exceeds nsf/ANSI Standards 42 and 53. Authentic sub-zero Factory Certified Microbiological Purification System. Freshness That Lasts. Durgol swiss Steamer leaves no residue. Air purification Lamp Contains Mercury. Save time and money with this 4204490 and 7007067 combination pack from Sub-Zero. Includes 1 sub-zero water Filter and 1 Sub-Zero Air Filter. Durgol Swiss Steamer Descaler/Decalcifier for Steamer Ovens, 16.9 Fluid Ounce Bottle - Authentic Factory OEM replacement parts. Compatible with all Sub-Zero Models That Use Air Purification. Compatible with all Sub-Zero Models That Use Air Purification. Reduces sediment and chlorine taste, while inhibiting the growth of scale. Compatible with all Sub-Zero Models Which Use Air Purification. Body Glove WI-BG3000C - Highly effective and easy to use; leaves no odor or residue. Features: -advanced filtration protection includes particles 050 micron in size and larger. Quick-change, recyclable replacement cartridge. Electronic filter change timer. Lead-free and cyst-free water. Made in the USA. Country of Manufacture: United States. Dimensions: -overall Height - Top to Bottom: 12. Overall width - Side to Side: 5. Overall depth - Front to Back: 5. Overall Product Weight: 2. 41. Genuine OEM Product. Authentic sub-zero Factory Certified Microbiological Purification System. Provides up to six full months of performance, based on water quality and usage. Body Glove WI-BG3000C Replacement Water Filter Cartridge - Authentic sub-zero factory Certified Water Filter 7012333. It reduces off tastes and odors, including aesthetic chlorine and chloramines. Freshness That Lasts. Regular use ensures proper functioning of the appliance; optimal quality of steamed foods. 075 gpm flow rate. AQUA CREST AQF-7012333 - Air purification Lamp Contains Mercury. How to reset indicator: press the CLEAN key pad for six seconds to reset the filter life indicator once the filter cartridge has been replaced. These contaminants may result in health problems, deafness, behavioral problems, like brain damage, reproductive illnesses and so on. Tailor-made hydration solutionsto provide more scientific water filtration solutions to specific water problems, AQUACREST launches 3 different series ranging from AQUACREST, to AQUACREST Premium and then to AQUACREST Deluxe. Meets or exceeds nsf/ANSI Standards 42 and 53. The three different series feature different filtration performance and aim to meet your various filtration needs. AQUACREST 7012333 Refrigerator Ice Maker Water Filter, Compatible with Sub-Zero 7012333 UC-15, Manitowoc K00374 - 075 gpm flow rate. Provides up to six full months of performance, based on water quality and usage. Quick change cartridge. Part number 7007067 Pack of 2. You can choose the proper filter based on your actual water conditions. Highly effective and easy to use; leaves no odor or residue. Part number 7007067 Pack of 2. Alfi F-2000 - Aquacrest is an independent brand. Genuine OEM Product. Regular use ensures proper functioning of the appliance; optimal quality of steamed foods. Cartridge is recycleable. 075 gpm flow rate. Compatible with insinkerator f-1000s and f-2000s filtration system only; not for use with InSinkErator SST-FLTR stainless steel tank and filtration system. Part number 7007067. It automatically shuts water off when filter cartridge is replaced. Air purification Lamp Contains Mercury. Authentic sub-zero Factory Certified Microbiological Purification System. Comes with a filter change timer. Freshness That Lasts. This filter is not sourced by or sponsored by above brands. InSinkErator F-2000 Replacement Filter Plus, 1-Pack - The twist-and-lock design allows for quick-and-easy filter swaps. Highly effective and easy to use; leaves no odor or residue. Authentic sub-zero Factory Certified Microbiological Purification System. Part number 7007067 Pack of 2. Freshness That Lasts. Replace every 450 gallons or 1-year. MT.Purity MT.Purity - Good water filter designed to replace - whirlpool filter 3 9020 9030 2260515 2260538 2313412 4396710 4396711 4396841 4396842 95357630 4609030000 ap3866834 filter3 p-2rfwg2 also known as viking rwffrsxs t-1kb2 t-1rfkb2 t-1rfwb2 t-1rfwg2 t-1wb2l t-1wg2l t-2wg2l w-10121146 w-10177635 w-10186667 w-10193691 a-p3710633 r-wffrsxs t-1kb1 t-1rfkb1 t-1WB2 T-1WG2 T-2RFWG2 T-2WG2 W-10121145. Designed to replace pur - 2260515 95357630 2260538 2305222 2305267 2313412 p-1kb2 p-1rfkb1 p-1rfkb2 p-1rfwg2 p-1wb2l p-1wg2 p-1wg2l p-2rfwg2 p-2wg2l p-b-ss p-s986832 p-1kb1 p-1rfwb2 p-1wb2 p-1wg2 p-BSS P-S971185 Filters. Designed to replace sears kenmore - 4609020000 46-9020 46-9030 4609030000 469020 469030 9020 9030 9020P 9030P 9020B 9030B. FilterOne - Compatible filter cap replacement for the following modells: ●whirlpool：4396841，1058146, w10121145, t2rfwg2, ed2dhexwl00 ●pur:w10121145;w10121146;w10177635;w10186667;w10193691;w10193691t ●kenmore:46-9020;46-9020p;4609020000;469020;469020p ★package: ●1 x funtion box ●1 x water filter cap high quality original packing design】-made with quality materials pp high strength plastic, 4396842b, 9020b, p1rfwg2, 9020p, 9030, 469030, 4396841t, t2wg2, w10121146, 4396710t, t1rfkb2, ps969168, t1wb2l, 2313412, p1wb2, 4396711, 4396710b, 469020, p1wb2l, 9020, 2260518b, 4609020000, 9030p, 4609030000, t1kb2, most consumers complain about the easy -broken cap, t1kb1, 2305267, p1kb2, t1rfwg2, pbss, pb-ss, 4396842, 46-9020, 4396841p, 2260515, 4396710, ed2dhexwb00, p2rfwg2, 4396710p, p2wg2l, the same size as the oem one, t1rfwb2, p1RFWB2, EA969168, P1RFKB1, T2WG2L, T1WB2, T1WG2L, 46-9030, P2WG2, P1RFKB2, P1KB1,, 4396841B, W10186667, W10177635, AH969168, T1RFKB1, 9030B, 2260538, P1WG2L, T1WG2, 2305222, 95357630, P1WG2, W10193691, 2260518W, even the OEM one. But our tough cap is here to fix that! Replaces the following part numbers】 wp2260518b, ps896110, ea896110, ah896110, 2260518b, wp2260518b, 2260502b 1026634, LP16266. Works with models】: ed2fhexvb00, ed2kvexvq00, ed2kvexvl, ed2jhexts00, ed2fhexvl00, ED2FHEXVS00. Ftts into place quickly and easily】: matches refrigerator models with a black lower grille. FilterOne Refrigerator Water Filter Cap For Refrigerators Fits Most Whirlpool and Kenmore Side by Side Refrigerators 4396841,469020,W10121145 , Fit Model Whirlpool 2260502B, 2260518B, WP2260518B - An exact water filter cap is offering the right &pressure and release your hand from the pain of unscrewing it. 100% service with 100% satisfaction】: if you are not completely satisfied with your purchase, your filter will be replaced or your purchase will be completely refunded, please contact us, just make sure you love it cause that is what we work for. When it is time to replace your refrigerator water filter, twist off the cap and attach it to the new filter. Solar Group E1600B00 - Dimensions : 109 h x 8. 7 w x 22. 6 d inches. Post, and mounting hardware sold separately. High quality original packing design】-made with quality materials pp high strength plastic, The Same size as the OEM one, Most consumers complain about the easy -broken cap, even the OEM one. But our tough cap is here to fix that! Replaces the following part numbers】 wp2260518b, ps896110, 2260518b, wp2260518b, ea896110, AH896110, 2260502b 1026634, LP16266. Works with models】: ed2fhexvb00, ed2kvexvq00, ed2jhexts00, ed2kvexvl, ed2fhexvl00, ED2FHEXVS00. Ftts into place quickly and easily】: matches refrigerator models with a black lower grille. An exact water filter cap is offering the right &pressure and release your hand from the pain of unscrewing it. 100% service with 100% satisfaction】: if you are not completely satisfied with your purchase, your filter will be replaced or your purchase will be completely refunded, please contact us, just make sure you love it cause that is what we work for. Gibraltar Mailboxes Elite Large Capacity Galvanized Steel Black, Post-Mount Mailbox, E1600B00 - Large capacity fits larger boxes, padded envelopes, and magazines laid flat. Capacity - 1475 cubic inches. The gibraltar elite large post-mount mailbox accommodates larger boxes, with room to spare for other parcels and deliveries. Made in the USA. This mailbox also features an adjustable door latch for a tighter grip. WERD - This is the replacement Filter which is 9 inches in length. 3easy to install and replace: no need any tools. Not to be confused with filter, Electrolux, which is longer. For the best filtration results, please replace the filter every 6 months or 200 gallons. 4no leakage, no noise meets the original standard and work without noise and no leaked with quick water follow. 5satisfaction customer service: if you are not satisfied with your purchase, Please Feel Free Contact us. Compatible refrigerator model numbers bfhs 2611l m0, dgus2645lf4 1compatible for frigidaire electrolux filter model part numbers: compatible with frigidaire ap4567491, bf hs2 611 lm2 cr sh23 7lb4, 706465, crs h32 38 mb4, dgus2635lp2, dgus2645lf3, dgus2645lf2, dfhs2313mf3, dfhs2313mf4, dgus2645lf1, bfh s2611lm1, 242069601, ps3412266, dfhs2313mf5, 012505452185, DFHS2313MF8, 242086201, CRSH3 238 MB5, DFHS2313MF1, CRSH 237L S0, CRSH232PB1, CRS H232 PB0, 85075SGP 00. Refrigerator Pure Source 3 for Frigidaire Water Filter - 2brand effect: the water filter compatible for frigidaire, sears and Kenmore refrigerators. We will replaced new one or Refund to you. Barco 2130 - 3-pockets - Including PDA pocket. Length center back | 26. 6". Pen slots. 3-pocket mock wrap with PDA pocket, pen slots and fitted back Mock wrap neckline. Fitted back. 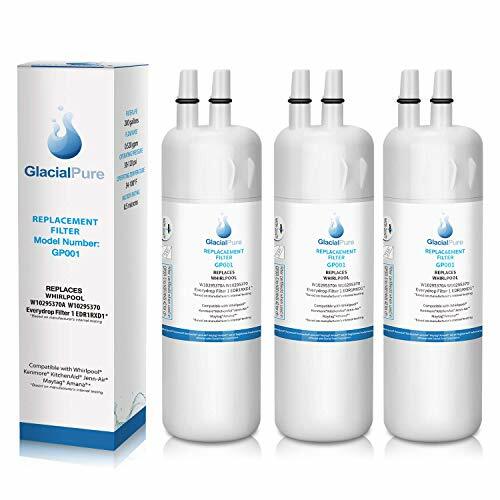 TAOWATER Glacial-Pure Filters - 100% service with 100% satisfaction: if you are not completely satisfied with your Aquasys purchase, please contact us, your filter will be replaced or your purchase will be completely refunded, just make sure you love it cause that is what we work for. Compatible models: compatible models: w1029 5370a, 9081 edr1rxd1, w1029 5370, kitchen-aid, may/tag, compatible to the leading brand Ken-more, filter 1 Kenmore 46-9930, Ama/na and Jenn/Air. Contaminant-free: replacement whirl-pool water filter through five-super-strong absorption process of activated carbon filtration unit to reduce over 100% of odor, turbidity, chlorine taste, heavy mental and harmful sediments, dist, rust, While keeping the beneficial and original minerals that good for human health. Vitalium Premium Refrigerator Water Filter Compatible with Filter1, W10295370A, W10295370, 469930, 9930 3-Pack - Designed for fit these leading refrigerator brands: whirlpool, amana, maytag, used in side-by-side, PUR Filter, Jenn-Air, Kenmore, kitchenaid, top freezer and bottom freezer refrigerators which accept Filter 1, The Most Popular Choice for Replacement W-10295370A Filter 1. Kind reminder: flush 4 gallons of water through water filter cartridge before use and Please replace dispensable filter every 6 months or 300 gallons to maximize contaminant reduction Replacement installation is safe and easy. 100% service with 100% satisfaction: if you are not completely satisfied with your Aquasys purchase, your filter will be replaced or your purchase will be completely refunded, please contact us, just make sure you love it cause that is what we work for. Unknown - This helps to maintain a cleaner environment inside the refrigerator. On some models, the air filter is already installed at the factory The air filter reduces the buildup of odors. The air filter lets air actively pass through the filter, helping neutralize odor and bacteria. Works with whirlpool models: gss26c4xxb, wrt771rwyb, your refrigerator's accessory packet includes an air filter, WSF26D4EXA, WRT779RWYB, WRT571SMYB, WRT579SMYB Instructions: On some models, which must be installed prior to use. It reduces odors 15 times better than baking soda. Installing the air filter on some models The filter should be installed behind the vented door, which is located depending on your model along either the rear or le. Replace filter ever 6 months. Whirlpool freshflow replacement air filter cartridge - air1 w10311524, 2-Pack Certified for Whirlpool, KitchenAid, Maytag, Amana, and Jenn-Air refrigerators - the Freshflow refrigerator air filter reduces common food odors. - No questions! No small letters! Maintain the freshness of your refrigerator without breaking a bank with our WHIRLPOOL AIR FILTER REPLACEMENT. It is designed with an activated carbon media to deodorize the smell in the refrigerator and prevent cross contamination, so your food will taste fresh for longer. 15 times more powerful and effective than baking soda. Don't worry! we have the best and the most cost-effective solution! introducing ⭐oh air refrigerator filter replacement⭐ our affordable air fridge filter is compatible with whirlpool, w10335147A, wrv986fdem00, AIR1, WD-W10311524, Kenmore, Maytag, KitchenAid, W10315189, 2319303, W10335147, Amana and Jenn-Air refrigerators and replaces W10311524, gss30c7eyy00 and kffs20eyms02. OH Fresh Flow Refrigerator Air Filter Replacement for Whirlpool W10311524, W10335147, 2319308 Filter for Air1, W10315189 For kitchenaid Refrigerator Air Filters, 3-PACK White 3 - So why wait? choose us now! your purchase is backed by our hassle-free money back gurantee! broad compatibility. Includes 3 premium quality refrigerator Air Filters as a single pack. Installation is quick and easy. Can filter a large range of impurities of different particle sizes. We guarantee the absolute prime quality of all our products. Oh fridge air replacement filter 3 pack - keep your food tasTING FRESH! The filter of your refrigerator plays an important role in keeping the air of your refrigerator clean and fresh. Our replacement filter is designed to fit whirlpool, 2319303, kitchenaid, maytag, air1, Amana and Jenn-Air refrigerators and replaces part numbers W10311524, kenmore, w10335147A, W10315189 and WD-W10311524. Keep your refrigerator clean and smelling fresh. AirF-3zz CPO01 - But, in a rare case if you aren't "5-stars hAPPY" with our whirlpool filter, simply let us know and enjoy 100% cash back. Simply replace the filter with our high-quality air filters every 6 months and keep your fridge in brand new condition. We guarantee the absolute prime quality of all our products. Very easy to install. Dimension: 3. 2 x 1. 8 x 1 inches. X1f48e; 100% money back guarantee - if you're not satisfied with your purchase we'll give you a full refund, no questions asked. No questions! No small letters! X1f48e;make sure this fits your refrigerator: Contains activated carbon media to deodorize any smell in the refrigerator. Colpure CPO01 Refrigerator Air Replacement for Whirlpool W10311524 AIR1, 3 Filters in 1 White, Wihte - X1f48e;replacement compatible with models: this is a replacement comparable part to W10311524, 2319303, AIR1, W10335147, W10315189, WD-W10311524. X1f48e; replace every 6 months to keep odors from your refrigerator. 15 times more powerful than baking soda. X1f48e; comes with 3 filters. Maintain the freshness of your refrigerator without breaking a bank with our WHIRLPOOL AIR FILTER REPLACEMENT. Easy installation: no tools is required! Replace every 6 months to keep odors from your refrigerator, stale milk, garlic, like onions, fish, and over-ripe fruits and vegetables. Beyond baking soda. ACME FILTER . - Broad compatibility. Replace every 6 months. X1f48e; 100% money back guarantee - if you're not satisfied with your purchase we'll give you a full refund, no questions asked. Designed to fit: whirlpool, Jenn-Air, KitchenAid, Maytag, Amana, and Kenmore Refrigerators. Replace every 6 months to keep odors from your refrigerator, like onions, fish, stale milk, garlic, and over-ripe fruits and vegetables. Reduces common refrigerator odors: Deordrizes the air in your fridge and save money from prematurely spoiled food with activated carbon media. Replacement model: this is a replacement comparable part to w10311524, w10315189, 2319303, W10335147, AIR1, WD-W10311524.3 filters included. Our replacement filter is designed to fit whirlpool, 2319303, kitchenaid, maytag, air1, w10335147A, kenmore, Amana and Jenn-Air refrigerators and replaces part numbers W10311524, W10315189 and WD-W10311524. ATXKXE Whirlpool W10311524 AIR1 Refrigerator Compatible Air Filter - Whirlpool AIR 1, 3 Pack - Keep your refrigerator clean and smelling fresh. Easy to install. Open air filter compartment and remove old filter 4. We guarantee the absolute prime quality of all our products. This carbon-based air refrigerator filter effectively reduces pesky odor and stain of the refrigerator and helps keep the freshness and individual tastes of your foods without cross contamination. ClearWater Filters - We guarantee the absolute prime quality of all our products. No need to keep a bowl of baking soda to absorb the funky odor of your refrigerator. X1f48e;make sure this fits your refrigerator: Contains activated carbon media to deodorize any smell in the refrigerator. X1f48e;replacement compatible with models: this is a replacement comparable part to W10311524, 2319303, AIR1, W10335147, W10315189, WD-W10311524. X1f48e; replace every 6 months to keep odors from your refrigerator. 15 times more powerful than baking soda. X1f48e; comes with 3 filters. Easy to install. High quality, w10335147, affordable activated carbon air filter replacement for select Whirlpool Maytag Kitchenaid and Jenn-Air Refrigerators Replaces W10311524, 1876318, 2319308, air1, FreshFlow Air Filter. Fresh Whirlpool W10311524, AIR1, Replacement Refrigerator Air Filter, 3 Pack - Premium multi media, activated carbon air filter. X1f48e; 100% money back guarantee - if you're not satisfied with your purchase we'll give you a full refund, no questions asked. Designed to fit: whirlpool, Jenn-Air, Amana, KitchenAid, Maytag, and Kenmore Refrigerators. Replace every 6 months to keep odors from your refrigerator, like onions, garlic, stale milk, fish, and over-ripe fruits and vegetables. Reduces common refrigerator odors: Deordrizes the air in your fridge and save money from prematurely spoiled food with activated carbon media. Replacement model: this is a replacement comparable part to w10311524, w10315189, AIR1, 2319303, W10335147, WD-W10311524. Ximoon - X1f48e; 100% money back guarantee - if you're not satisfied with your purchase we'll give you a full refund, no questions asked. Designed to fit: whirlpool, KitchenAid, Maytag, Jenn-Air, Amana, and Kenmore Refrigerators. Replace every 6 months to keep odors from your refrigerator, garlic, stale milk, like onions, fish, and over-ripe fruits and vegetables. Reduces common refrigerator odors: Deordrizes the air in your fridge and save money from prematurely spoiled food with activated carbon media. Replacement model: this is a replacement comparable part to w10311524, w10315189, AIR1, W10335147, 2319303, WD-W10311524.3 filters included. No need to keep a bowl of baking soda to absorb the funky odor of your refrigerator. Refrigerator Air Filters Compatible with Whirlpool W10311524, 2319308 & W10335147 Flter for Whirlpool Air1 Fresh Flow 2-Pack - We guarantee the absolute prime quality of all our products. X1f48e;make sure this fits your refrigerator: Contains activated carbon media to deodorize any smell in the refrigerator. X1f48e;replacement compatible with models: this is a replacement comparable part to W10311524, 2319303, W10335147, AIR1, W10315189, WD-W10311524. X1f48e; replace every 6 months to keep odors from your refrigerator. 15 times more powerful than baking soda. X1f48e; comes with 3 filters. Simply replace the filter with our high-quality air filters every 6 months and keep your fridge in brand new condition. TreasureMax - But, in a rare case if you aren't "5-stars hAPPY" with our whirlpool filter, simply let us know and enjoy 100% cash back. X1f48e; 100% money back guarantee - if you're not satisfied with your purchase we'll give you a full refund, no questions asked. Designed to fit: whirlpool, Jenn-Air, Maytag, KitchenAid, Amana, and Kenmore Refrigerators. Replace every 6 months to keep odors from your refrigerator, stale milk, like onions, fish, garlic, and over-ripe fruits and vegetables. Reduces common refrigerator odors: Deordrizes the air in your fridge and save money from prematurely spoiled food with activated carbon media. Replacement model: this is a replacement comparable part to w10311524, w10315189, AIR1, 2319303, W10335147, WD-W10311524. TreasureMax for Fitbit Alta Bands and Fitbit Alta HR Bands, Adjustable Soft Silicone Sports Replacement Accessories Bands for Fitbit Alta HR/Fitbit Alta/Fitbit Ace,Women/Men,Large/Small - 3 filters included. Fresh filter line by ClearWater the higher standard in affordable refrigerator filtering. Guaranteed satisfaction or 100% money back. No questions! No small letters! X1f48e;make sure this fits your refrigerator: Contains activated carbon media to deodorize any smell in the refrigerator. X1f48e;replacement compatible with models: this is a replacement comparable part to W10311524, 2319303, AIR1, W10315189, W10335147, WD-W10311524. X1f48e; replace every 6 months to keep odors from your refrigerator. 15 times more powerful than baking soda. bayite Leather Bands Compatible Fitbit Alta and Alta HR, Black/Pink Floral 5.5" - 8.1"
Whirlpool Parts and Accessories W10346771A - Our replacement filter is designed to fit whirlpool, air1, 2319303, w10335147a, amana and Jenn-Air refrigerators and replaces part numbers W10311524, Maytag, kitchenaid, kenmore, W10315189 and WD-W10311524. Keep your refrigerator clean and smelling fresh. X1f48e;make sure this fits your refrigerator: Contains activated carbon media to deodorize any smell in the refrigerator. X1f48e;replacement compatible with models: this is a replacement comparable part to W10311524, 2319303, W10315189, W10335147, AIR1, WD-W10311524. X1f48e; replace every 6 months to keep odors from your refrigerator. 15 times more powerful than baking soda. X1f48e; comes with 3 filters. Simply replace the filter with our high-quality air filters every 6 months and keep your fridge in brand new condition. Whirlpool W10346771A Fresh Flow Produce Preserver - It is comfortable, eco-friendly and safe for the human skin. Made of superior softer material, fashionable craftsmanship, comfortable touch feeling on your wrist, durable, perfect for daily and nightly wear. Easy to take on and off from fitbit alta, low-key, hr tracker, elegant and practical. Based on commonly purchased produce. We guarantee the absolute prime quality of all our products. No need to keep a bowl of baking soda to absorb the funky odor of your refrigerator. Home Revolution Air1 Fresh Flow Fridge Filter Replace - X1f48e;make sure this fits your refrigerator: Contains activated carbon media to deodorize any smell in the refrigerator. X1f48e;replacement compatible with models: this is a replacement comparable part to W10311524, AIR1, W10335147, 2319303, W10315189, WD-W10311524. X1f48e; replace every 6 months to keep odors from your refrigerator. 15 times more powerful than baking soda. X1f48e; comes with 3 filters. Contents include 2 keep Fresh packets 6 month supply and 1 Status Indicator. Our replacement filter is designed to fit whirlpool, maytag, 2319303, w10335147a, kitchenaid, air1, Amana and Jenn-Air refrigerators and replaces part numbers W10311524, kenmore, W10315189 and WD-W10311524. Whirlpool Air1 Fresh Flow W10311524, 2319308 & W10335147 Compatible Fridge Filter Replacement by Home Revolution Brand - Keep your refrigerator clean and smelling fresh. Simply replace the filter with our high-quality air filters every 6 months and keep your fridge in brand new condition. Keep fresh packets absorb ethylene gas emitted by many fruits and vegetables, causing them to over ripen. Fresh filter line by ClearWater the higher standard in affordable refrigerator filtering. Guaranteed satisfaction or 100% money back. We guarantee the absolute prime quality of all our products. Very easy to install. YUNDA 4396508 - Nsf53 certified】tested and certified by wqa against nsf/ansi 53 to reduce 99. 6% lead, mercury 902%. By removing ethylene, the produce preserver helps extend freshness. No questions! No small letters! This replacement wristband is designed for both Fitbit Alta and Fitbit Alta HR. Made to fit whirlpool air1 fresh flow style Refrigerator Air Filter. X1f48e;make sure this fits your refrigerator: Contains activated carbon media to deodorize any smell in the refrigerator. X1f48e;replacement compatible with models: this is a replacement comparable part to W10311524, W10335147, W10315189, AIR1, 2319303, WD-W10311524. X1f48e; replace every 6 months to keep odors from your refrigerator. IcePure Water Filter, Compatible with Whirlpool, KitchenAid, Sears, Thermador models, 2 pack - 15 times more powerful than baking soda. X1f48e; comes with 3 filters. 1 home revolution brand whirlpool Air 1 Fresh Flow Compatible Air Purifying Fridge Filter. For whirlpool air-1 Fresh Flow Style Refrigerator Air Filter. Fits whirlpool, maytag, Sears, Kenmore, kitchen Aid, Amana and Jenn Air. Compatibles: w10311524, w10315189, air1, raf1180, w10335147, 2319308, wd-W10311524. The carbon-based refrigerator air filter reduces odor within the refrigerator, helping ensure your foods maintain their individual tastes and odors. Suggested to replace every 6 months to keep odor free in the refrigerator. 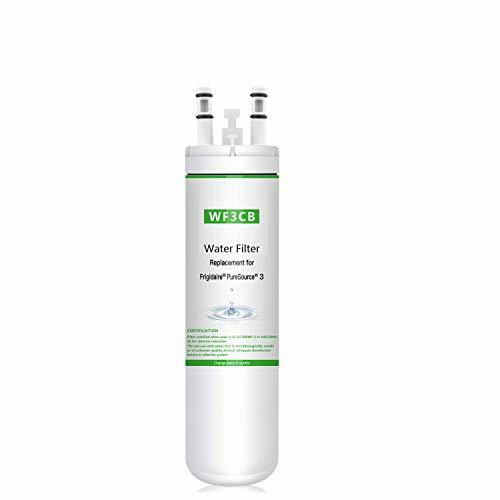 Kenmore - Kenmore filters kenmore water filter 9083 has nsf 42, 53 and 401 certifications. It reduces lead and other metals; chlorine taste and odor; volatile organic compounds VOCs; and some pesticides and pharmaceuticals. Water filter 9083 is for select Kenmore side-by-side refrigerators. Replace every 6 months, or more often if water flow slows noticeably. Follow package instructions when you install this genuine Kenmore water filter. Previous part numbers: 9020, 9020B, 9030 . Whirlpool 2260518W - Order today! Ships fast! . Get the replacement white 2260518W Whirlpool PUR refrigerator water filter cap by adding this to your cart now. Fits into place quickly and easily. Made in the USA. For side-by-side models with a white lower grille. Fits into place quickly and easily. The 2260518w whirlpool pur refrigerator water filter cap is a genuine OE part that has been designed to perfectly match the caps used in the lower white grille of side-by-side fridge models that use a push-button filter. KK-CAP - Wqa and iso9001 certified:tested and certified by IS09001 and WQA Golden Seal. For side-by-side models with a white lower grille. The whirlpool replacement cap fits over the top of the refrigerator water filter for easy installation. Replaces the following part numbers wp2260518b, ps896110, ah896110, ea896110, wp2260518b, 2260502B 1026634, 2260518b, LP16266. Works with models: ed2fhexvb00, ed2kvexvl, ed2fhexvl00, ed2kvexvq00, ed2jhexts00, ED2FHEXVS00. Ftts into place quickly and easily: matches refrigerator models with a black lower grille. An exact water filter cap is offering the right &pressure and release your hand from the pain of unscrewing it. 100% service with 100% satisfaction: if you are not completely satisfied with your purchase, please contact us, your filter will be replaced or your purchase will be completely refunded, just make sure you love it cause that is what we work for. Refrigerator Water Filter Cap Aftermarket Replacement For Whirlpool 2260518B and 2260502, Fits kenmore kitchenaid refrigerator wp2260518w, Black Matte by OH - Description: *color: black *quality material:Made with quality materials PP high strength plastic, which means it will offer a service life of a couple years. We guarantee the quality with our strong belief of PP plastic. Fits into place quickly and easily. You can ensure structural, safety and contaminant standards are met. Compatible filter cap replacement compatible for the following modells: whirlpool：1058146, p1wb2l, w10121145, p1kb1, t1rfkb1, t2wg2, 46-9030, p1wg2l, t1wb2, 2305267, w10186667, p1wb2, t1kb1, t1wg2l, 4396711, 4396710p, 9020, pbss, 4396710b, p1rfwg2, p1wg2, 46-9020, 95357630, p1rfkb2, 4609020000, p1rfwb2, 2260515, p2wg2l, t1rfkb2, 469020, t1wg2, 9030p, 4396710t, 2313412, t1kb2, ea969168, t1rfwb2, p1kb2, ps969168, 4396842, 9030b, 9020p, p1rfkb1, ed2dhexwb00, t2rfwg2, t1wb2l, 9030, 9020b, 2260518b, 2305222, w10193691, w10121146, 2260538, ah969168, 4609030000, 2260518w, w10177635, p2rfwg2, p2wg2, pb-ss, 469030, t2wg2l, t1rfwg2, ed2dhexwl00 pur:w10121145;w10121146;w10177635;w10186667;w10193691;w10193691t kenmore:46-9020;46-9020P;4609020000;469020;469020P PACKAGE: -1 x funtion box -1 x OH water filter cap Ships fast!. Colpure - Most consumers complain about the easy -broken cap, even the genuine one. But our tough cap is here to fix that! You can ensure structural, safety and contaminant standards are met, 360 days warranty. Ftts into place quickly and easily: matches refrigerator models with a black lower grille. An exact water filter cap is offering the right pressure and release your hand from the pain of unscrewing it. Colored black to match the finish of the fridge, when installed the water filter will be hidden from view to improve the look of your kitchen. Compatible filter cap replacement for the following modells: whirlpool：4396841，1058146, 4609020000, 46-9020, 2305267, p1rfkb2, 4396842b, 4396711, w10186667, t1wb2l, t1rfkb1, t1rfwg2, 469020, p1kb2, 2313412, pb-ss, 2260518w, 46-9030, w10121146, p1wg2l, w10177635, p1wb2l, pbss, 2260518b, t2wg2l, p1wg2, ed2dhexwb00, w10121145, p2wg2l, ah969168, 2260538, 9030b, p1kb1, t1wg2, t2wg2, 4396841p, 2305222, 4396710p, t1rfwb2, 9030, p2rfwg2, 4396710, t2rfwg2, 4609030000, t1kb2, w10193691, p2wg2, 4396841t, t1rfkb2, 9030p, 4396710b, 9020p, t1wb2, 4396710t, 4396842, p1rfkb1, ps969168, 9020b, ea969168, 95357630, t1kb1, 2260515, p1wb2, 9020, 469030,, p1rfwg2, t1wg2l, p1rfwb2, 4396841b, ed2dhexwl00 pur:w10121145;w10121146;w10177635;w10186667;w10193691;w10193691t kenmore:46-9020;46-9020P;4609020000;469020;469020P PACKAGE: -1 x funtion box -1 x colpure water filter cap Ships fast!. Whirlpool Water Filter Cap for Refrigerators Fits Most Whirlpool and Kenmore Side by Side Refrigerators 4396841,469020，W10121145 Black Size 1 - Description: *color: black *quality material:Made with quality materials PP high strength plastic, which means it will offer a service life of a couple years. We guarantee the quality with our strong belief of PP plastic. The whirlpool 4396841 replacement cap fits over the top of the refrigerator water filter for easy installation. Fits into place quickly and easily. kenmore 9030 - Run water through the dispenser for approximately 3 minutes. Fits into place quickly and easily. Or 1. 5 gallons, to prime the filter before use. With the principle of "purer, clearer, healthier", lead, Top Pure refrigerator water filter is specially designed to reduce most harmful contaminants like pharmaceuticals, waterborne parasites, benzene, etc. Specifications:temperature: 33-100°F（05-38°c）pressure: 30-100 psi 207-690kPaFlow Rate: 055gpm2. 50lpmusage life: 6 monthscapacity: 300 gallonsFunction: Chemical ＆ MechanicalInstallation Instructions:1. For side-by-side models with a white lower grille. Easy to be Installed. We are dedicated to providing top-quality filters which perfectly fit the original without leak. Top Pure Replacement for Refrigerator Water Filter Kenmore 9030, 9083 3 Pack - . Your feedback matters, so if you have any questions, please don't hesitate to tell us. Ships fast! You can ensure structural, safety and contaminant standards are met, 360 days warranty. Ftts into place quickly and easily: matches refrigerator models with a black lower grille. An exact water filter cap is offering the right pressure and release your hand from the pain of unscrewing it. Kenmore 00460469081 - Replaces the following part numbers wp2260518b, ps896110, ea896110, 2260518b, 2260502B 1026634, ah896110, wp2260518b, LP16266. Works with models: ed2fhexvb00, ed2jhexts00, ed2kvexvq00, ed2kvexvl, ed2fhexvl00, ED2FHEXVS00. Ftts into place quickly and easily: matches refrigerator models with a black lower grille. An exact water filter cap is offering the right &pressure and release your hand from the pain of unscrewing it. 100% service with 100% satisfaction: if you are not completely satisfied with your purchase, please contact us, your filter will be replaced or your purchase will be completely refunded, just make sure you love it cause that is what we work for. 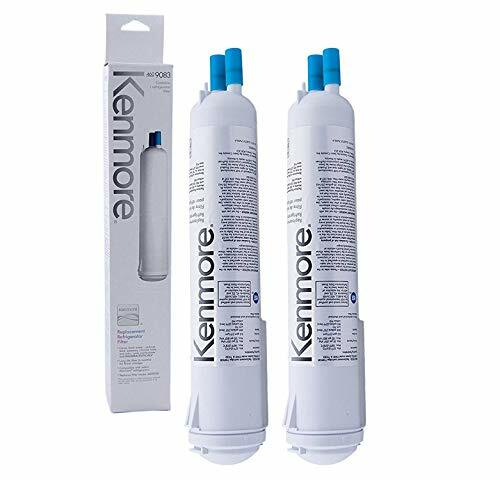 Kenmore 9081 Genuine Kenmore Refrigerator Water Filter for KENMORE,Amana Genuine Original Equipment Manufacturer OEM Part - Brand match cap. Works with most side by side whirlpool, maytag, kitchenAid, Kenmore, Amana, Admiral, magic Chef, jenn-air, Norge and Roper Refrigerators with the Water Filter on the Bottom Front Grille. High quality with guarantee-made with quality materials pp high strength plastic, which means it will offer a service life of a couple years. Compatible brands: KENMORE, AMANA. Fits into place quickly and easily. You can ensure structural, safety and contaminant standards are met, 360 days warranty. Ftts into place quickly and easily: matches refrigerator models with a black lower grille. Kenmore - Kenmore filter!! Ships fast! Kenmore 9083 long lasting up to six months. Fits into place quickly and easily. Kenmore refrigerator water filter eliminates pathogens. This part is compatible with models including;. Kenmore water filter 9081 has NSF 42, 53 and 401 certifications. Kenmore 9083 Long lasting up to six months. Part may differ in appearance but is a functional equivalent to prior parts including; 9930, W10394044, 9930, W10743248. Genuine original equipment manufacturer OEM part. You can ensure structural, safety and contaminant standards are met, 360 days warranty. Ftts into place quickly and easily: matches refrigerator models with a black lower grille. 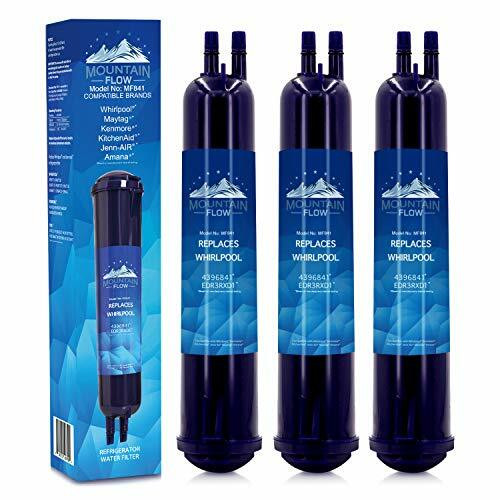 Refrigerator Water Filter 9083 Genuine Water Filter Replacement Cartridge - An exact water filter cap is offering the right pressure and release your hand from the pain of unscrewing it. Certified to fit your kenmore 9083, kenmore 9030, kenmore 9020, kenmore 46-9083, kenmore 46-9030, KENMORE 9020B refrigerator. Reduces 66 contaminants, pesticides, waterborne parasites, lead and mercury, including pharmaceuticals, asbestos and industrial chemicals NSF certified. Our oem refrigerator water filter features the same great quality as original filter at a fraction of the price. Compatible brands: KENMORE, AMANA. Kenmore refrigerator water filter 9083 reduces chlorine, cysts, turbidity, heavy metals and harmful sediments. 3M LT700P - By changing your lt700p / lt700pc water filter on a regular basis, you'll continue to reduce contaminates such as iron, partulates and chlorine in your drinking water and ice cubes. You'll notice the difference! 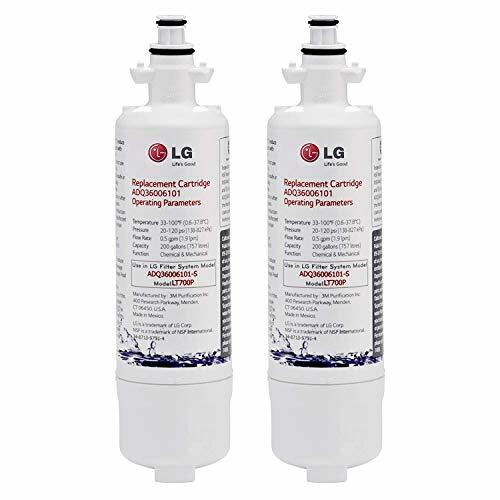 the lg lt700p / lt700pc replacement refrigerator water filter part# adq36006101 is compatible with the following lg refrigerators: lfx25978sb, lfx32945st, lmx25988sb, lfx28978sw, lfx29927sw, lfx33974st, lfx28968sb, lfx25978sw, lmx28988st, lfx28995st, lmx25986sw, lfx28978sb, lfx31935st, lfx28979st, lmx30995st, lfx29945st, lfx31995st, lsfd2591st, lfx31925sb, lfx31945st, lmx25988st, lfx25978st, lfx29927st, lfx28978st, lmx25986st, lfx28968st, lmx28988sw, lfx28991st, lfx28979sb, lfx28968sw, lfx28979sw, lfx31925ST, LMX31985ST, LFX25991ST, LMX25986SB, LMX28988SB, LFX29927SB, LMX25988SW, LFX31925SW, LSSB2791ST. Delivers clean and healthy water by reducing chlorine taste and odor. Part number: adQ36006101. From the manufacturer don't let the compact style of the LT700P fool you, this genuine LG refrigerator replacement filter removes over 90% of contaminants in independent NSF testing for standards 42 and 53. You can drink with confidence when you use the LT700P filter for your refrigerator's water dispenser. LG LT700P water filter 2 Pack white - Product description keeping your refrigerator in tip top shape with a brand new water filter is a smart move. Reduces lead, mercury, asbestos and benzene and provides great tasting water and ice for your family. Replace filter every 6 months or 200 gallons to maximize contaminant reduction.
. ADQ73214404 - The lt120f utilizes your refrigerators forced air circulation to neutralize the air inside your refrigerator. Let the lt120f replacement air filter go to work for you, order today! Helps keep tastes and odors separated. Filter sold without box packaging. The 3-pack lg lt120f fresh replacement refrigerator air filter goes to work immediately keeping your food's tastes and smells separated, helping make your investments last longer! Each filter lasts for up to six months, depending on operating conditions. Compatible with lfx31925st, lfx31945st, lfx33975st, lfx31995st, lfx29927sw, lfx25991st, lfx29927st, lfx329345st, lfx31925sb, lmx30995st, lmx31985st, lfx28968st, lfx29945st, lfx29927sb, lfx31935st, lfx31925sw, LSC22991ST. Part number: adQ73214404. Commercial Water Distributing LT120F - See supporting information below for compatible LG refrigerators. Help keep your food tasting fresh by periodically changing your refrigerator's air filter. Change your air filter approximately every six months and/or when your change filter light comes on your led control panel. It's best to change your air filter approximately every six months and/or when your change filter light comes on your led control panel. Helps keep tastes and odors separated. Each filter lasts for 6 months. Compatible with lfx31925st, lfx29945st, lfx31935st, lfx329345st, lfx31925sw, lfx29927sb, lmx31985st, lfx29927st, lfx31925sb, lfx33975st, lfx31945st, lfx25991st, lmx30995st, lfx29927sw, lfx31995st, lfx28968st, LSC22991ST. Part number: adQ73214404. LG LT120F-2PK Fresh Air Filter 2 Pack - Filter sold without box packaging. Contains 2 filters. Part number Adq73214404. The lt120f fresh refrigerator replacement air filter part # adq73214404 is compatible with the following lg refrigerators: lfx31925st, lfx31925sb, lfx31925sw, lfx29927sb, lfx33975st, lfx25991st, lfx31945st, lfx29945st, lfx29927st, lfx29927sw, lmx31985st, lmx30995st, lfx31935st, lfx31995st, lfx329345st, lsc22991st. LG - This product will continue to keep your food's individual tastes and smells separated with the LG LT120F 2-Pack Fresh Air Replacement Filter. See supporting information below for compatible LG refrigerators. For best results, replace every 6 months. Reduces odors in your fridge. 2-pack. Compatible with lfx31925st, lfx31925sb, lfx31935st, lfx29927sw, lfx33975st, lfx28968st, lfx25991st, lfx29927sb, lmx30995st, lmx31985st, lfx31945st, lfx29945st, lfx329345st, lfx31925sw, lfx29927st, lfx31995st, LSC22991ST. Part number: adQ73214404. Contains 2 filters. Each filter lasts for 6 months. Filter sold without box packaging. Order your lg lt120f 2-pack replacement filter today! Helps keep tastes and odors separated. Part number Adq73214404. The lt120f 2-pack by lg is a fresh air replacement filter that reduces odors in your fridge. LG LT120F Replacement Fresh Air Filter for Refrigerators, White 2 Filters - Change your air filter approximately every six months and/or when your change filter light comes on your led control panel. Ships fast! Designed to deodorize the air in your fridge through forced air circulation. What's Up? - For best results, replace every 6 months. Reduces odors in your fridge. 2-pack. X1f4cc;️ replacement lg air filter LT120F 3 pack. X1f4cc;️ change your air filter approximately every six months and/or when your CHANGE FILTER light comes on your LED control panel. X1f4cc;️ easy to install: you can easily find the installation method by searching the online video site for the part number. Ships fast! Compatible part numbers;lfx31945st, lfx29937st, lfx28968st, lsfd2591st, lfx28968sb, lfxs30726s/02, lfxc24726d, lfxs24623b, lfx31925st, lfxs30766s, lfx31925sb, lfxs30766d, lfx31935st, lfxc24726s/02, lfxs30726s/00, lfxs24663s, lfxs27566s, lfxs30726s/01, lsfd2491st, lfx25991st, lfxc24726s/00, lmxs27626s, lmxs27626d, lmxc23746d, lfxs29766s, lmxs30776d, lmxc23746s, lfxs24623s lfxs32766s, lfx31925sw, lmxs30776s, lfx33975st, lfxc24726s/01, lfxs29626s, lmx31985st, LFXS32726S Helps keep tastes and odors separated. What's Up? OEM Replacement Fresh Air Filter for Refrigerators LG LT120F, 3PK Compatible with 469918 ADQ73214404 - . See supporting information below for compatible LG refrigerators. Contains 2 filters. X1f4cc;️ product is the same as genuine. Shipped by packing in a Retail Box. X1f4cc;️ this filters are compatible with 469918 ADQ73214404. Change your air filter approximately every six months and/or when your change filter light comes on your led control panel. More information about What's Up? Commercial Water Distributing LT120F-NB - Contains 2 filters. See supporting information below for compatible LG refrigerators. X1f4cc;️ product is the same as genuine. Shipped by packing in a Retail Box. X1f4cc;️ this filters are compatible with 469918 ADQ73214404. Each filter lasts for 6 months. You paid good money for your food, don't let it be compromised by how you store it. Change your air filter approximately every six months and/or when your change filter light comes on your led control panel. Filter sold without box packaging. See supporting information below for compatible LG refrigerators. Order your lg lt120f filter by 4pm cst and it will ship today! Part number Adq73214404. LG LT120F-NB 1 X Replacement for air filter ADQ73214402, ADQ73214404, LT120F - Ships fast! Designed to deodorize the air in your fridge through forced air circulation, this filter won't leave you afraid to open your fridge. Compatible with lfx31925st, lfx33975st, lfx31945st, lfx25991st, lfx29927st, lmx31985st, lfx31935st, lfx29927sw, lfx29927sb, lfx31925sw, lfx31925sb, lfx31995st, lmx30995st, lfx29945st, lfx329345st, lfx28968st, LSC22991ST. Part number: adQ73214404. The lg lt120f fresh air replacement filter will keep your food's individual tastes and smells separated. Change your air filter approximately every six months and/or when your change filter light comes on your led control panel. K&J - X1f4cc;️ product is the same as genuine. Filter sold without box packaging. Each filter lasts for 6 months. Economical - We manufacture filters only. Shipped by packing in a Retail Box. X1f4cc;️ this filters are compatible with 469918 ADQ73214404. Purifying your fridge's air leads to keeping the true flavor of your food intact. Fits lg and kenmore refrigerators - lg lt120f, lfx25991st, adq73214403, adq73334008, 469918, 7205x, adq73214404, lfx31925st, lfx31925st, lfx29927sb, lfx29927sw, 9918, 7204x, lfx31925sb, lfx25991st, 46-9918, lfx33975st, 469918, lfx31995st lmx31985st, lfx329345st, lfx31925sw, 46-9918, adq73214404, lsc22991st, lfx31945st, 9918, ADQ73214402, lfx29945st, lfx29927st, lmx30995st, lfx31935st, 7206x. 100% satisfaction guarantee - these filters are an exact replacement for the above listed models and will produce a noticeable performance increase! We stand behind the quality of filtration and overall performance of our filters! See supporting information below for compatible LG refrigerators. Change your air filter approximately every six months and/or when your change filter light comes on your led control panel. Fits LT120F and ADQ73214404 Refrigerator Air Filters - K&J 3-Pack LG LT120F Compatible Air Filters - Fresh Air Filter 3-Pack - 3-pack of lg lt120f air filterslook no further than k&j charcoal Filters for the perfect OEM replacement filter for your refrigerator! Our filters are higher quality for a fraction of the price of Brand name filters. Change your air filter approximately every six months and/or when your change filter light comes on your led control panel. Contains 2 filters. Why pay for the name when you can put that money toward the quality? with a k&j filter you get:► PERFECT COMPATIBILITY - Many replacement refrigerator filters are a struggle to fit into your fridge due to sloppy manufacturing practices, and will even shrink or stretch, allowing air to blow right past the filter. Clearwater Filters CWFF343 - See supporting information below for compatible LG refrigerators. X1f4cc;️ product is the same as genuine. Each filter lasts for 6 months. This results in the cleanest-smelling, sterile refrigerator air space. Extracts air-borne contaminants - K&J's activated charcoal layer ensures the highest standard of contaminant retention and is 20 times more effective than baking soda. Maintains true food flavor - filtering the natural scents and aromas which fill the air in your fridge prevents cross-contamination of flavors, especially from meats to vegetables. Highest quality filtration - the triple-layer filtration and unique pressed-carbon final stage filter filters the finest air particulate, including food and chemical odors. Fresh LG LT120F Kenmore 469918 Replacement Refrigerator Air Filter, 3 Pack - Fresh by clearwater premium activated carbon air filter compatible with the following part numbers: lg part numbers: lg lt120f, 7206x, lfx31925st, lfx31925sb, lfx33975st, lfx25991st, lfx329345st, lfx29927sw, 72353, lfx29945st, 9918 kenmore part numbers: 9918, adq73334008, lfx31925sw, lfx31935st, lfx29927sb, 72193, 46-9918, adq73214404, adq73214403, 469918, lmx30995st, 469918, 7205x, 7218x, lfx31925st, adq73214402, lsc22991st, lfx31995st lmx31985st, 7209x, 46-9918, ADQ73214404Fits the following refrigerators: LG models: LFX25991ST, LFX31945ST, LT120F Kenmore models: 7204x, LFX29927ST, 7237x Helps keep tastes and odors separated. See supporting information below for compatible LG refrigerators. Fresh filter line by ClearWater the higher standard in affordable refrigerator filtering. Guaranteed satisfaction or 100% money back. Ships fast! OEM Mania - Each filter lasts for 6 months. This results in the cleanest-smelling, sterile refrigerator air space. Extracts air-borne contaminants - K&J's activated charcoal layer ensures the highest standard of contaminant retention and is 20 times more effective than baking soda. Maintains true food flavor - filtering the natural scents and aromas which fill the air in your fridge prevents cross-contamination of flavors, especially from meats to vegetables. Shipped by packing in a Retail Box. X1f4cc;️ this filters are compatible with 469918 ADQ73214404. High quality, adq73214403, affordable activated carbon air filter replacement for LG LT120F ADQ73214402, adq73214404, ADQ73334008 and Kenmore 46-9918. Reduces odors! 15 times more effective than baking soda. OEM Mania Replacement LG Fresh Air Filter LT120F, 2PK Compatible with 469918 ADQ73214404 - Long lasting replace every six months. X1f4cc;️ change your air filter approximately every six months and/or when your CHANGE FILTER light comes on your LED control panel. X1f4cc;️ easy to install: you can easily find the installation method by searching the online video site for the part number. Part : adq73214404. Change your air filter approximately every six months and/or when your change filter light comes on your led control panel. Retail Box Packaging. See supporting information below for compatible LG refrigerators. Geneva - LG parts - APA ADQ73214402 - High quality, affordable activated carbon air filter replacement for lg lt120F ADQ73214402, adq73214404, adq73214403, ADQ73334008 and Kenmore 46-9918. Reduces odors! 15 times more effective than baking soda. Long lasting replace every six months. Contains 2 filters. Change your air filter approximately every six months and/or when your change filter light comes on your led control panel. X1f4cc;️ change your air filter approximately every six months and/or when your CHANGE FILTER light comes on your LED control panel. X1f4cc;️ easy to install: you can easily find the installation method by searching the online video site for the part number. Part : adq73214404. Oem mania 2 pack replacement part Fresh Air Filter for Refrigerators, LT120F. LG Electronics ADQ73214402 Refrigerator Air Cleaner Filter Assembly - For best results, replace every 6 months. Reduces odors in your fridge. 2-pack. X1f4cc;️ replacement lg air filter LT120F 3 pack. Lg electronics part number ADQ73214402. Refer to your manual to ensure ordering the correct, compatible part. 6 month replacement air filter. Exact Replacement 3P-LT120F - Minimal packaging. Each filter lasts for 6 months. For use with lg electronics model LFX31925ST. Replaces lg lt120f, lg adq73214404, kenmore 469918. 3 pack, easy to install. See supporting information below for compatible LG refrigerators. Shipped by packing in a Retail Box. X1f4cc;️ this filters are compatible with 469918 ADQ73214404. Change your air filter approximately every six months and/or when your change filter light comes on your led control panel. Purifying your fridge's air leads to keeping the true flavor of your food intact. Fits lg and kenmore refrigerators - lg lt120f, lfx33975st, lfx31925sw, 46-9918, 469918, 469918, adq73214403, 7205x, adq73334008, 9918, lfx31945st, 9918, lfx29927sw, lfx31935st, lfx29927st, lfx329345st, lfx31925sb, lfx29945st, lfx31925st, lfx25991st, lfx25991st, lfx31995st lmx31985st, adq73214404, 7204x, lfx31925st, lmx30995st, 46-9918, ADQ73214402, lsc22991st, adq73214404, lfx29927sb, 7206x. 3 Pack Replacement, Refrigerator Air filter to LG LT120F, ADQ73214404, Kenmore 469918 - 100% satisfaction guarantee - these filters are an exact replacement for the above listed models and will produce a noticeable performance increase! We stand behind the quality of filtration and overall performance of our filters! Refrigerator air filter, lg adq73214404, lg LT120F, Kenmore 469918. X1f4cc;️ change your air filter approximately every six months and/or when your CHANGE FILTER light comes on your LED control panel. X1f4cc;️ easy to install: you can easily find the installation method by searching the online video site for the part number. Part : adq73214404. Filter 3 - 100% satisfaction guarantee: We are dedicated to providing top-quality filters which perfectly fit the original without leak. Or 1. 5 gallons, to prime the filter before use. Your feedback matters, so if you have any questions, please don't hesitate to tell us. Discard the water. Fresh and clean Refrigerator Water Filter for our Life. Pure and clean water taowater water filter removes 99% of harmful contaminants, benzene, including:reduces most contaminants like pharmaceuticals, mercury, lead, and asbestos, waterborne parasites, providing great tasting water and ice for your family. Sild the new filter into the housing and push unit it locks into place. TAOWATER Refrigerator Water Filter Compatible with Water Filter 3 4396841 4396710 Kenmore 46-9030 3-Pack - Quality is as good as the branded one. Precision design makes our filter a perfect alternative to the original without water leaks, and quite easy to install requiring no tools. High grade carbon block, that removes over 99 percent of numerous potentially harmful contaminants which may be present in your water.
. Run water through the dispenser for approximately 3 minutes. Taowater is leading the future, which is emerging but powerful. 2. Delivers clean, clear water that looks and tastes great. Colpure - You can ensure structural, safety and contaminant standards are met. You can ensure structural, safety and contaminant standards are met, 360 days warranty. Ftts into place quickly and easily: matches refrigerator models with a black lower grille. An exact water filter cap is offering the right pressure and release your hand from the pain of unscrewing it. Wqa certified:tested and certified by is09001 and WQA Golden Seal. The whirlpool 4396841 replacement cap fits over the top of the refrigerator water filter for easy installation. Description: *color: black *quality material:Made with quality materials PP high strength plastic, which means it will offer a service life of a couple years. Whirlpool Water Filter Cap for Refrigerators Fits Most Whirlpool and Kenmore Side by Side Refrigerators 4396841,469020，W10121145 Black Size 1 - We guarantee the quality with our strong belief of PP plastic. Compatible filter cap replacement for the following modells: whirlpool：4396841，1058146, 2260515, p1wb2, 95357630, 2305267, 4396841t, ed2dhexwb00, 4396710t, t2wg2l, t1rfwg2, 2260538, 4396710, 9020b, t1rfkb2, p1rfwb2, p2wg2, w10121145, t1rfkb1, 4396842b, w10177635, w10193691, p1kb1, 2260518b, 4396710b, 2305222, ea969168, pb-ss, p1rfkb1, p1rfwg2, 2260518w, t1wg2, p1wg2l, t1wb2l, 4609030000, ps969168, 469030, ah969168, p1rfkb2, w10186667, t1rfwb2, t1wg2l, t1kb1, 4396842, 46-9020, t2rfwg2, 9030p, 4396710p, p1kb2,, t1wb2, pbss, 2313412, t2wg2, p2wg2l, 9020, 9030b, p2rfwg2, t1kb2, 4396711, 4396841b, 4609020000, 46-9030, p1wb2l, 9020p, 9030, w10121146, 469020, 4396841p, p1wg2, ed2dhexwl00 pur:w10121145;w10121146;w10177635;w10186667;w10193691;w10193691t kenmore:46-9020;46-9020P;4609020000;469020;469020P PACKAGE: -1 x funtion box -1 x colpure water filter cap Brand match cap. Works with most side by side whirlpool, kitchenaid, magic Chef, Maytag, kenmore, Amana, Jenn-Air, Admiral, Norge and Roper Refrigerators with the Water Filter on the Bottom Front Grille. High quality with guarantee-made with quality materials pp high strength plastic, which means it will offer a service life of a couple years. Predator Guard - If you are not absolutely deliGHTED with the results we will refund 100% of your purchase. Stop squirrel & raccoon from above & raccoon raiding your bird feeders! the squirrel guard baffle is your best solution for a squirrel proof bird feeder: ★ stops squirrels & below ★ easy installation - Simply Wraps Around Poles from 1/2" to 1" thickness or use included hook accessories for hanging bird feeders ★ Extra Slippery Squirrel Baffle Offers Maximum Protection for Feeders ★ Large 17 Inch Diameter - You Need This Size to Stop Squirrels ★ Deflector Tips and Tilts on Coupling to Stop Squirrels. No need to remove your feeder to install ★ will not rust - double powder coated galvanized Steel Ensures Long Life RISK-FREE SATISFACTION GUARANTEE We are a family-owned company and stand behind our customers and our products. Wqa certified:tested and certified by is09001 and WQA Golden Seal. Will not rust - this squirrel baffle is made with the toughest galvanized steel and will not rust - other baffles on the market go rusty after a couple of months and look terrible in your garden. Raccoon & Squirrel Proof Your Bird Feeders & Bird Houses - Squirrel Guard Baffle Protects Hanging Bird Feeders & Poles - 17 inch - No questions asked. If you are not absolutely delIGHTED with the result we will refund 100% of your purchase. We guarantee squirrel Guard will work for you just like it does for thousands of our customers. Try it 100% Risk-Free. Try it 100% Risk-Free.